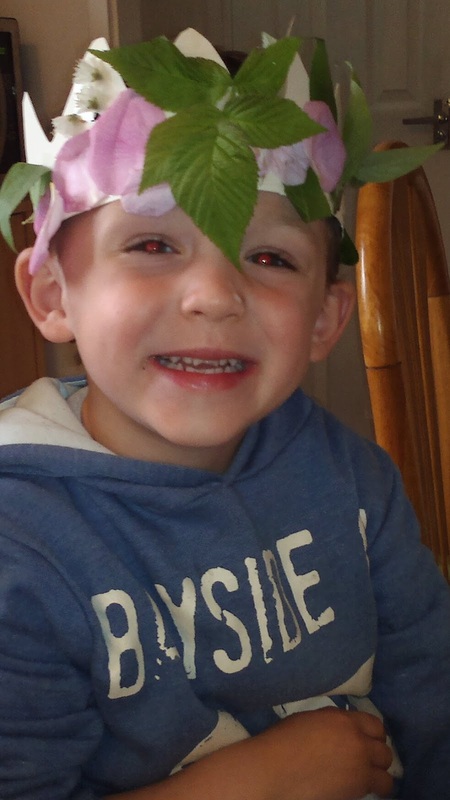 This afternoon we explored the scents and textures of the leaves and petals in the garden, and chose our favourites to make a midsummer crown. I've been thinking about ways to look at and celebrate the changing seasons, and today seemed like a good day for this one. The initial idea was to make the crowns at home (they're a cereal packet cut up and taped to the right size for the boys heads), attach a strip of double sided tape and take them to the woods to fill with seasonal colours. However, after several hours of walking and playgroup this morning Ollie's little legs weren't up to any more long walks, and mine didn't mind not pushing Toby in the pram again either, so we gathered our materials from the garden and made the crowns on the kitchen table. The jewel in the crown, so to speak, of this change in plans was the discovery of the first ripe raspberries of the year hiding under some foliage, which caused great delight in my fruit addicted boys. Both boys enjoyed touching and smelling the leaves and petals, and choosing which to collect for their crowns (although Toby took as much delight in tipping his collection out as in gathering it in the first place). The language development opportunities include developing descriptive vocabulary and cognitive skills such as choosing favourite smells and shapes and explaining why they are a favourite - 'I like the lavender because it smells pretty' or 'I like this leaf because it is dark green and shiny'. 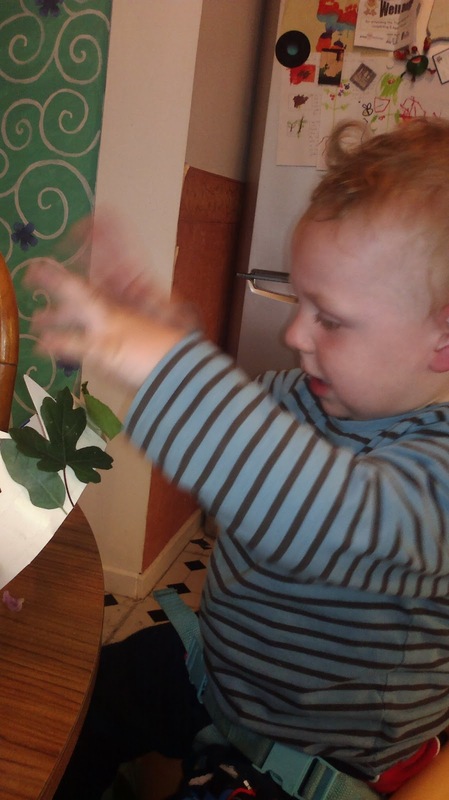 It is also a good activity for shape matching - 'can you find me another leaf with lobes like this one' while tracing his finger around the shape of the leaf. Toby made the leap today of actually sniffing leaves such as mint without just stuffing them straight in his mouth (this is a massive jump considering he was the only toddler at playgroup today eating plain flour with a teaspoon while the others were stirring bowls of biscuit mixture). Ollie was really pleased with his crown and wore it for a long time. Toby enjoyed sticking the leaves down and then, when the crown was full, pulling them all off again. We had a lovely conversation about how the leaves have been growing, about bees and pollen and flowers and fruit, and about how in a few months the leaves will change and on deciduous trees they will drop off. He told me he doesn't like snow but it will be Okay because we can go to the shop and buy a 'snow tray with string on it' (toboggan). He also liked looking at the snails we found and when I told him that they were both boys and girls at the same time said 'that is amazing'. He even repeated the word 'hermaphrodite' back first time, although I don't think he will remember what it means for some time. Children are sponges and using descriptive language with them every day, even if you think it's too advanced at the time, helps them over time to absorb the words they need to accurately describe the world around them. Helping them to master a wide vocabulary in turn helps their cognitive skills because we think in words. The activity can be backed up with all sorts of other skills - counting leaves, grouping colours and storytelling with a book related to seasons, or crowns or anything else you fancy as your theme. We chose 'When Dragons are Dreaming' by James Mayhew and Lindsey Gardiner because although not directly linked to seasons, Ollie likes to imagine the Dragon and the fairies playing in his garden and Toby loves the pictures.